Today we spent making memories with my family. Stars Wars in IMAX followed by a meal at Longhorn restaurant made for a delightful day. Sadly Josh had to leave after the movie. He was on-call for his job. My daughter, Tyna, my niece Jenn, her husband Jim, my husband Mike and I had a very relaxing evening. So today blogs is about taking time to spend with family, make memories and just enjoy life. I have recorded private thoughts in my journal. Not everything needs to be made public on the internet. It is the diary or journal you keep, that family will loved to read later, that is important. Tell about the smiles when gifts are opened, the hugs for family members you haven’t seen in years, maybe even about the food you ate. It is interesting what people eat; spouses both liking burgers or spouses split in their likes, one vegetarian-one a meat eater, another going for the shrimp. Desserts like chocolate lava cake or a shared black forest lava cake, carrot cake and a banana cream pie, when normally no one eats dessert is a story in itself. After dinner and you’re in your own homes, the “guys” are playing with the new “toys’ they received. 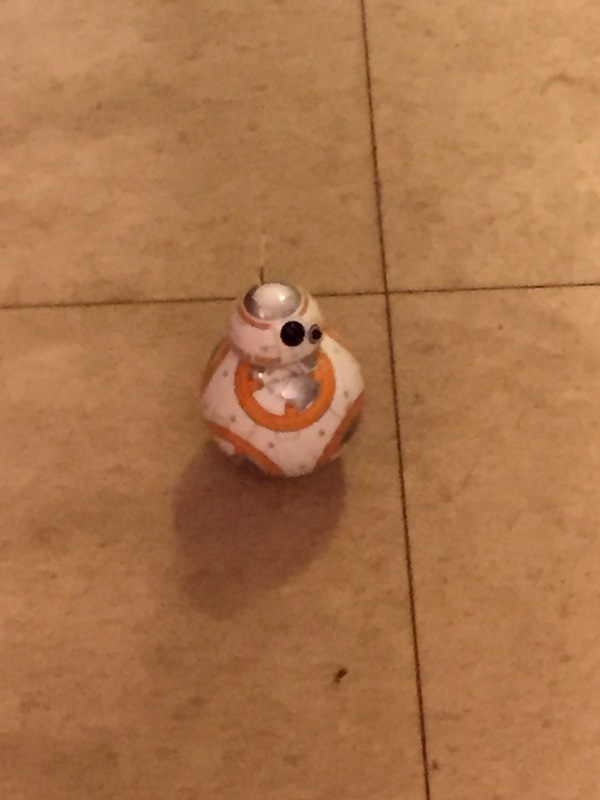 A droid call BB-8 from the Star Wars movie and the other setting up his drone. The ladies text each other so our talking wouldn’t bother the guys while programming the toys, about how much fun the guys are having, wishing we were both in the same place to watch together. We all loved our gifts, the memories and look forward to more to come. Mother and daughter both brought each other jewelry. Great minds think alike. Enjoy life. Every moment is a special gift. That is my tidbit for today.